Russian World Forums • View topic - Why they Promote “Mail Order Bride"? Why they Promote “Mail Order Bride"? Post subject: Why they Promote “Mail Order Bride"? Many of you, who have read previous posts of mine, know just how disgusted I feel when anyone refers to any Russian Woman, as a “Mail Order Bride”. This was certainly the case yesterday when I found a Wikipedia article entitled “Mail Order Bride” that probably was written by a group of Feminists. The main implication of this article is that ANY Woman who is from a non-western country who joins an introduction agency or a Dating Site, is a M.O.B. So I want to know, if this is the case then, what does that make any American or Western Woman who joins a service like Yahoo Personals, Match.com, e-Harmony and so many other dating sites? Is it possible to get married to any of “these women” solely through seeing their profile on a web catalogue and sending some money? The fact is, that there is NO SUCH THING as a Mail Order Bride to begin with. It is clear that this is one of the most derogatory and degrading terms possible for Women anywhere. Unfortunately it’s probably going to stick around for a while as long as certain profiteering groups continue to promote it for their own agenda. Unfortunately I’ve known that the M.O.B. label is often used by unscrupulous agencies and front companies who are trying to pass off Russian Women as cheap commodities that are easily attainable. The motive behind these groups are obvious. They simply wish to hook as many bottom of the barrel or “Lowest Common Denominator” Guys as possible and make a few quick bucks in the process. Unfortunately there will always be a percentage of Guys who are dumb enough to actually believe this crap..
As long as Mail Order Brides can be used as a wide spread label against Russian and FSU Women. It serves as a Very Effective and Classic SMEAR Tool for the Feminist to SCARE OFF any Quality Western Men and Russian Women from attempting a relationship with each other. This is why M.O.B. is often the first tag that any Feminist would try to pin on anyone who sea’s the value in looking beyond their own country for a lasting relationship. The M.O.B. tag is widespread enough that even various agencies and websites have used it to market themselves to naive and lonely Men who may only be aware of this label as they try to search the Internet for true love. Many of these Men get burned in the process and the Feminists are laughing their asses off every time. So if any of you people are planning on going through a Marriage Agency.. At the very least AVOID any of them that use the M.O.B. tag! Post subject: Re: Why they Promote “Mail Order Bride"? I will start my answer by repeating a post that I made on this forum a while ago when this subject was discussed previously. The post that I made then was along these lines. I bought a mail order catalogue a few weeks ago. I looked through the catalogue until I found something that I liked, I then went ahead and bought it. When I came back from work today I found two notes in my letter box. The first note said "Hello, this is your friendly postman, I tried to deliver a package to you today, but it was too big to fit in your letter-box so I left it with your neighbour"
The second note said "Hello, this is your friendly neighbour, I would like to invite you to my wedding. Can I sue my neighbour for theft? Can I get my money back using the distant sales act? The proper term should be "long distance introduction agency" or "international introduction agency". No normal woman is going to marry a man who just "orders" her. You must meet her, her friends and family and spend some quality time together. Just more sour grapes from jealous overweight ugly self entitled "feminists". Well since you both mentioned that you don't see a difference between an American man meeting a women from the FSU and one meeting a woman from America on match.com or the like I would like to say that both agency types could be appropriately called M.O.B's. Just the B stands for something else. With agencys like Elanas it equals Bride, With agencys like Match and eHarmony it is "Mail Order Biitch" You have heard all us talk about AW and should have known that. Actaully the difference I see between MOB agencies and firms like Match.com is the goal of the parties. Most women from Russia and most men who meet them have a goal of marriage. Since it is the only way it works there are few other options. Most people who meet on Match are looking to be a cougar or looking for a body to share a bed with until they get bored or find a hotter body. Yes, sometimes it does end up in marriage but that is the exception. My wife has fun when she found out about the MoB business.... Looking lovely and just arrived by post.. She was cold in the plane but now that she's with me all is good. For a start lets concentrate on the "Mail Order" part of the term. Mail order is a term which describes the buying of goods or services by mail delivery, usually by browsing through a catalogue. The buyer places the order for the desired products with the merchant through some remote method. Most things are available through mail order. The start of the mail order concept. According to The National Mail Order Association, Benjamin Franklin is believed to have been the first cataloguer in the United States. In 1744, he formulated the basic mail order concept when he produced the first catalogue, which sold scientific and academic books. So as we see it the Mail-order concept originates from the Northern part of the North American continent namely The United States of America and Canada. Aaron Montgomery Ward (February 17, 1843 – December 7, 1913) was an American businessman notable for the invention of mail order. The mail-order industry was started by Aaron Montgomery Ward in 1872 in Chicago. The earliest surviving mail-order business, now known as Hammacher Schlemmer, was established by Alfred Hammacher in New York City in 1848. Offering mechanic's tools and builder's hardware, its first catalogue was published in 1881. The T. Eaton Co. Limited was once Canada's largest department store retailer. It was founded in 1869 in Toronto by Timothy Eaton, an Irish immigrant. 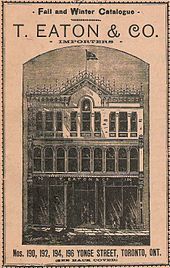 Eaton's grew to become a retail and social institution in Canada, with stores across the country, buying offices across the globe, and a catalogue that was found in the homes of most Canadians. The first Eaton's catalogue was a 34-page booklet issued in 1884. As Eaton’s grew, so did the catalogue. By 1920, Eaton's operated mail order warehouses in Winnipeg, Toronto and Moncton to serve its catalogue customers. Catalogue order offices were also established throughout the country, with the first opening in Oakville in 1916. It then took a few years for the mail-order concept to cross the Atlantic back to the Old world. Universal Stores was founded in 1900 as a mail order business in Manchester, England by Abraham, George and Jack Rose. Before we start with the bride it is beneficial to note that in the past many (if not all) marriages were based upon what today we would call an arranged marriage normally arranged by a "Match Maker"
We now go to the imported mail-order-bride issue. Historically, mail-order imported brides were women who listed themselves in catalogues and were selected by men for marriage. Sometimes the men and women involved were citizens of different countries, e.g. women from European countries moving to the United States during the 18th and 19th centuries, and sometimes they involved citizens of the same country. Those women were considered pioneers. Although historically, mail-order imported brides came from well-developed areas to marry men in overseas colonies and frontier lands, the trend has reversed. Recently, the trend is perceived as one of women who live in developing countries seeking men in more developed countries. It is my opinion that women that advertised themselves as available for marriage to men that they had not meet previously were not know as mail-order brides until the advent of Pathetic Correctness and the brigades of self opinionated feminazis and their lapdog new-men. I do find the term mail order bride insulting, and that is because it implies that the bride has been purchased the same way that someone would purchase an item from a mail order catalogue. Why is the term so one sided? After all people that meet on the internet are both displaying themselves in an electronic catalogue. Is it because the feminazis feel threatened? Answers to the above on a Postcard please. The first of the conundrums. If a couple meet through the internet but they also live in the same place (town or city) then would the lady be considered to be a mail order bride? And here is a different conundrum. A colleague of mine is married to a lady from the Philippines, he meet her in a bar in Japan (they were both working there but their meeting was not job related). And the query, is she a mail order bride, the reason that I ask is because she is from the Philippines and all Philippinas are considered to fit the criteria (given by the feminazis) of mail-order brides. They now live in his country (In Europe). I meet my fiancée in a bar in Russia, she is Russian, I was working at the time in Russia. Now we know that all Russian ladies that are married to foreigners automatically become mail order brides. So when we marry does she automatically become "mail order". We will live mostly in her country (Russia).